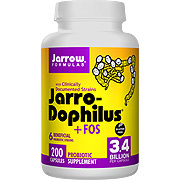 Jarro-Dophilus + FOS survives stomach acid and colonizes the intestines. * FOS is a natural fiber that enhances the growth of beneficial probiotic bacteria. * Each capsule contains 3.4 billion total probiotic bacteria. Take 1 - 3 capsules per day with unchilled water, or dissolve capsule in mouth, 20-60 minutes after eating. For infants and children, open capsules and pour contents into water or over food. Or take as directed by your qualified health consultant. Other Ingredients: Maltodextrin and magnesium stearate. Capsule consists of gelatin Contains NO gluten. Contains dairy (milk and whey) and soy. This probiotic is great. It is really good for you and I love this one because the Jarrow Formula brand is amazing. These pills work great and will definitely keep me at bay with anything to come. What are FOS and/or Inulin? FOS and Inulin are fibers (i.e. indigestible carbohydrates). They are consumed (used as fuel) by the friendly bacteria (the Bifidobacteria, especially) in our gut and contribute to the proliferation of these good bacteria, which will assist in lowering levels of pathogens and other invading organisms. Will the FOS affect my blood sugar? No. FOS are consumed and digested by bacteria. Humans lack the beta amylase enzyme necessary to digest FOS. Does FOS promote the growth of Candida? What is the source of the FOS? Chicory root is the source of the FOS for our product. Do these bacteria work in both the small intestine and colon? The lactobacilli are the dominant, resident, friendly bacteria in the small intestine; the bifidobacteria are anaerobic and are the dominant, resident, friendly bacteria in the colon. Thus, taking a probiotic with both lactobacillus and bifidobacteria species will address the varied microflora profile in both the small intestine and colon. Is it free of yeast, soy, egg, wheat, gluten, corn, tree nuts, peanuts….? 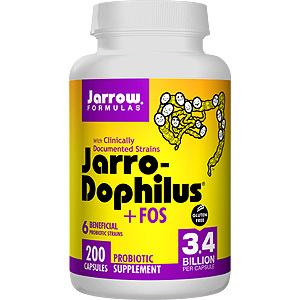 Yes, the Jarro-Dophilus +FOS is free of yeast, corn, egg, gluten, wheat, barley, oats, tree nuts, peanuts, and fish, including shellfish. Contains trace residues of dairy and soy. What is the source of the maltodextrin? Primarily from corn, although sometimes from rice. Is it safe for individuals who are allergic to dairy? There may sometimes be a miniscule amount of dairy present in our finished probiotic products. However, this amount is so trivial that it is virtually impossible for it to cause any allergic (milk/dairy) reaction. What are the sources for these bacteria? The strains were selected from human and other sources, including cheese (Jarro-Dophilus EPS only) and kefir. What are these bacteria grown on? A nutritive growth media is used to grow the probiotic bacteria. The growth media include casein and soy peptides. Why do we recommend taking it 20-60 minutes after eating? Shouldn’t probiotics be taken before meals? The issue is the concentration of hydrochloric acid (HCl) in the stomach (and thus the pH of the stomach). While it is true that HCl is released in response to the consumption of food, it is also true that on an empty stomach, the pH of the stomach is very low (very acidic environment). Since there is no food present to absorb the hydrogen ions released by the acid, the pH is low and could potentially kill the bacteria faster due to the higher acidity of the empty stomach. By taking it 20-60 minutes after a meal, this will allow time for the pH to rise somewhat (i.e. the acidity to go down) due to the presence of the food in the stomach, and thus allow for higher survivability of the bacteria. Can probiotics be taken while on antibiotics? Should I wait until after finishing the antibiotic before taking it? Should I take more than the recommended dose? After finishing the antibiotic, for how long should one take the Jarro-Dophilus + FOS? Yes, the Jarro-Dophilus + FOS can be taken concurrently with antibiotics. However, it should be taken at a separate time (e.g. 2-3 hours either side of the antibiotic). People will often double the normal recommended dose while taking antibiotics and continue for a short time after completing the antibiotic therapy (1-2 weeks). Can this product be taken indefinitely? Yes, this product can be taken indefinitely. It is very safe to do so and will continue to promote good health and efficient digestion. Yes, the bacteria in this product are live. If it is not enteric coated, how do the bacteria survive the stomach acid? Won’t all the bacteria be killed by the stomach acid? While many bacteria are killed by the acidic environment of the stomach, some bacteria still manage to survive. The human intestinal tract is home to several hundred trillion live bacteria that are present naturally, regardless of whether or not one has ever taken a probiotic supplement. Moreover, bacteria reproduce logarithmically, meaning that they are capable of doubling their numbers in short order and repeatedly to yield very significant numbers of live bacteria. What is the attenuation rate? If left out of refrigeration at room temperature for one month, the loss, on average, would be 10-20%; the attenuation rates for the 2nd and 3rd months would be the same after which the rate would flatten out and attenuate at a much slower rate thereafter. Refrigeration can mitigate the loss to under 5% per month. How many live bacteria are there when I buy it? How long after the product arrives at the store before it gets purchased, a time which will vary with each purchaser of the product. How long the product sits in the person's refrigerator until it is used up (1 month.....6 months....1 year?). This can vary dramatically. There are many factors involved in the handling and shipping of the probiotic product throughout its life cycle (manufacturer to the retailer to the customer.....shipping conditions; was it refrigerated at the retailer? Was it kept in a hot storage facility at the retailer? Did the consumer leave it in his/her hot car in the middle of July in California for 4-5 hours? There is no way we can answer the question as there are just too many confounding factors involved. However, because the potency can be determined at time of manufacture, we do give the amount of viable bacteria present at this time. Also, we put plenty of "overage" into all Jarrow Formulas probiotic products in order to help ensure, to the extent that we can, that the consumer will get 100% of label claim at the time of consumption. Nevertheless, as pointed out above, there are some things we cannot control for. If consumers put the probiotic viability at risk due to their own negligence (e.g. hot car, storing it near the oven, etc.) this is something we cannot control for and, therefore, we would not be able to assure the live cell count. How many live bacteria are present at the time of expiration? Assuming proper handling conditions, we are confident in saying that at the time of expiration the product will have at least 50% of its original claimed potency. Is it safe to take after the expiration date? Although the potency will have attenuated, the product is still safe to take. Moreover, the cell wall components of the dead bacteria have been shown to promote healthy immune function. I left the bottle out of the refrigerator overnight. Is it still any good? Yes, it is still plenty potent. Assuming no extreme (i.e. hot) temperatures, this length of time is not long enough to significantly affect the potency. Is it better to keep it in the freezer? No, freezing may lead to some loss of viability. It is best to keep it refrigerated. Does it need to be kept cold or refrigerated during shipping? It can be out refrigeration for about one week or so without any appreciable loss; during summer months, this time should be limited to 3 days. Does it need to be refrigerated before opening? Yes, it should be kept refrigerated before opening. When these organisms were first isolated, the bifidobacteria were obtained from human sources. However, all of these organisms are found naturally in the human digestive tract where they implant and colonize. Since humans are sterile at birth (i.e. have no bacteria in their GI tract), humans get these organisms naturally through contact with the external environment and consumption of fermented foods such as kefir/yogurt. Research has shown that these organisms, regardless of the sources, are beneficial to human health. Antibacterial drugs can kill of the good bacteria. Note: Since the dairy and soy peptide residues that may be present in the Jarro-Dophilus + FOS would be so miniscule, we do not feel that the product is contraindicated for those individuals sensitive to dairy and/or soy. Although rare, in some individuals, FOS may cause flatulence. In general, this probiotic formula is very well tolerated. JARRO-DOPHILUS+FOS - is shipped in a discrete, unmarked package. Orders are processed immediately and usually take about 3 to 5 working days to be received. We do ask that you try it for 2 to 3 weeks to feel the full effects. Any information received is used only for order processing and shipping purposes. Your information, such as e-mail address, will never be disclosed to a thirdp party.